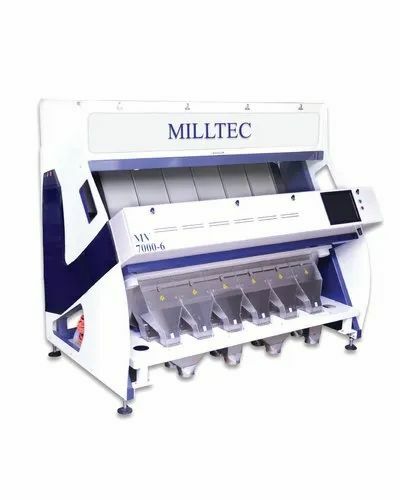 The True Trichromatic Sorter for suitable Rice, Pulses and less than 5mm Grains. Double vision system (16200 pixel RGB CCD cameras) allows checking on both sides, detecting even the slightest difference with 0.01 mm resolution. Product Scanning Speed 30000 lines/sec. We can select Good & bad based on image we can sort effectively. Real time Analysis of Impurity & Capacity (Online). Sorter Can be Controlled by Android Mobile through Wi-Fi Technology. Innovative Centralised Cloud system for machine Health check-up using Sim card. Reverse Sorting, Shape & Size Sorting technology. Lighting system: Programmable White & Blue LED lighting system. Life Span 50,000 hrs. Suitable for Multi Products Sorting. Maglev tech based 0.8ms Speed of Solenoid valves, up to 1250 cycles/sec. Life span for 10 billions of cycles (1000 Crore Cycles). Individual Ejectors technology.